I received the following sad news yesterday of Dr. Atsumi Ohno’s death from Hiroshi Soda who ran the University of Toronto Ohno Continuous Casting (OCC) Research Lab. It was sad news but a lot of good memories remain. Dr. Atsumi Ohno was a dear family friend. My father, Dr. Robert Huang, first met Dr. Ohno while both were doing their PHD studies in engineering at University of Toronto in the early 1960s. Dr. Ohno went back to Japan to start his research activities in Metallurgical Engineering at the Chiba Institute. My father became a Professor of Chemical Engineering at University of Waterloo (Ontario, Canada) specializing in polymer membranes. Here is a picture of my father and Dr. Ohno taken many years after they first met. 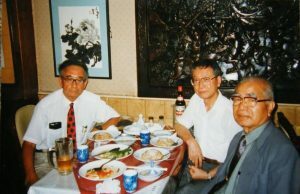 Dr. Robert Huang, Dr. Kojima, and Dr. Atsumi Ohno having dinner in Japan.